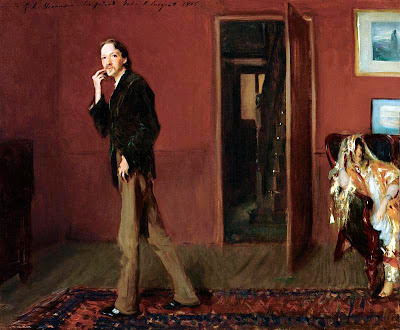 The VV loves these portraits by John Singer Sargent. 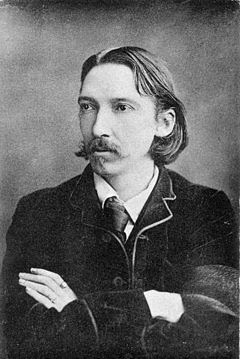 They show the writer Robert Louis Stevenson. They seem so immediate and 'modern' and the one below is stunning. Who could fail to be drawn to such an attractive and seemingly vigorous character, his eyes full of earnest intelligence and warmth as they stare right out from the canvas, making an intimate connection with the viewer as if he were with us, right here, right now? 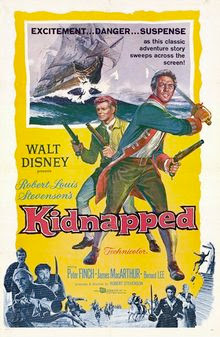 The VV would say that he certainly had the X Factor, with that not restricted to the marks he made on maps of buried treasure! And then, of course, there is his wife; the exotically-dressed woman to the right of the frame of the portrait below, whose bohemian appearance illustrates the free and artistic lifestyle upon which she and her husband embarked ~ rather than the stricter conventional one of his puritanical Scottish family. 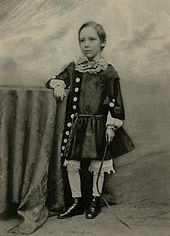 Ever since he was a child, growing up in Edinburgh, Stevenson had been plagued by ill health. Tuberculosis led the adult man to have an unusually thin and frail demeanour. But his character was always strong. He refused to succumb to the sedentary life of an invalid and, ironically, his illness may well have contributed to his future career as a writer. While he was travelling in France, seeking material for his work, Stevenson met his future wife ~ even though the American Fanny was already married to somebody else. But, not to be deterred by that he eventually made her his own wife, bringing her back to Europe from her native California - along with her son, Lloyd Osbourne, who inspired Treasure Island as discussed in another VV post. For more about his life with Fanny the VV recommends a book written by Nancy Horan. Under the Wide and Starry Sky is published in America by Random House, and in the UK by Two Roads Books. Avoiding cold weather that harmed his health, the family spent their summers in Scotland and the winter months in France. 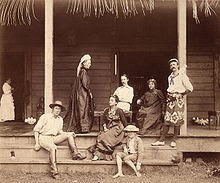 But, after the death of Stevenson's father they travelled to the Hawaiian Islands, settling in Samoa where Stevenson felt his artistic spirit to have been truly released. There, he enjoyed new vigour and increasingly better health until, at the age of forty-four, he suffered a fatal haemorrhage. Had Stevenson gone on to live until a naturally old age who can say what new wonders he might have produced. 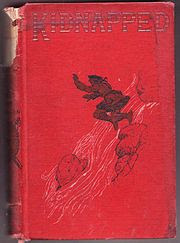 Most of the stories he did write are still selling well as classics now, with many stage and screen dramatisations of Treasure Island, Kidnapped, or The Black Arrow - or the dark and sinister gothic tale of Doctor Jeckyll and Mr Hyde. 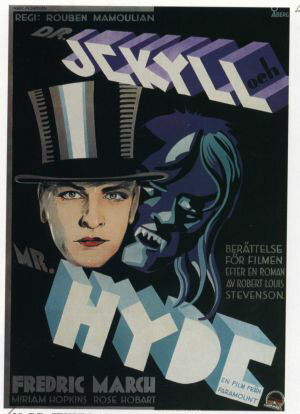 But, Stevenson was not a man whose talents were restricted by genre. He also produced A Child's Garden of Verses, a compilation of poetry that entranced the VV when she was a child - just as it did Isobel Dixon, the contemporary poet who recently wrote her own tribute to Robert Louis Stevenson. 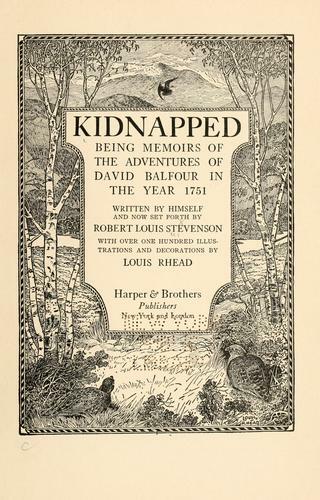 When we were children, my Great Aunt Ella used to send us, her horde of South African nieces, lovely little gold-embossed leather-bound copies of Rudyard Kipling and Robert Louis Stevenson books as gifts each year. Far away from us in Scarborough, she may have lost track of what she'd sent before, and there was some duplication over the years, but we never minded. We loved that these were not 'childish' gifts and opening that package and dividing up the beautiful slim books was always a delight. I'm just sorry that my stash of them is back home in South Africa and not on a shelf within arms' reach in my study. I have been unable to resist duplication of course, especially when confronted with old second hand editions, and have Kidnapped again, Virginibus Puerisque (a title which always fascinated me with its strangeness), a dinky hardback copy of The Pocket RLS (‘Being Favourite Passages from the Works of Stevenson’) which I bought with some of the pages still uncut, and the gift of a beautifully bound Familiar Studies of Men and Books. My older sisters, especially Mary Lou, used to read to me and I remember snippets of the flight across the heather in Kidnapped, and the pleasing echo of Scottish place-names. But most of all I remember watching the film – whichever adaptation it was. I can't remember anything else about it, not even whether it was colour or black and white (the way memory re- or de-colours things) but what remains vivid is the tension as David Balfour mounts the perilous stairs of the tower in the House of Shaws, watched by his treacherous uncle Ebenezer Balfour – and then, in the flickering candlelight, almost meets his end as the half-built stairs simply cease. That lurching moment, the near-plunge down the tower has sometimes echoed in dreams since. My early Vertigo moment. But my mother's beautiful illustrated hardback volume, a prized possession, was also a source of great mortification for me. 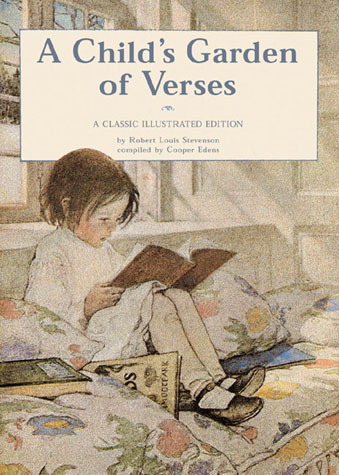 I can't track down the exact edition – A Child's Garden of Verses is one of the most illustrated children's books, with more than 100 editions– but I remember the fresh colours and the pretty children on its pages. I was bored, it was a hot afternoon, my parents napping after lunch, my sisters playing outside, not wanting to be bothered with their three-year-old sister. Though I couldn't read, I recognised the poems that had been read to me, but I wanted something more from the book, and it struck me for some reason that I should colour in the little girls' pupils. My mother's precious book was much more alluring than my own colouring-in books – but no longer so pristine once my clumsy hand had deployed her marking pen (for indelibly labelling my sisters’ school clothes) and I watched in horror as the discreet (I’d thought) black pinprick spread. Not just over the little British children’s irises, but across half their faces, as though they had been punched in the face, had black eyes or were wearing masks. Maybe I unconsciously hated those neat children, or maybe it was just that I loved the book so much I wanted to be part of its creation and adaptation too, who knows, but I had turned A Child’s Garden of Versesinto something spoiled, and sinister. I can’t remember if I tried to hide it when my mother woke, but my sense of shame would have been blazoned across my own face, I was so horrified at what I had done. I remember that shame more than the hiding after. I also thought of Stevenson (or ‘Tusitala’, ‘the storyteller’ as he was called by Samoan locals) when I was in Pascal Petit’s poetry workshop in Tate Modern’s Gauguin exhibition halls a couple of weeks ago. The paintings from his own South Sea Island days on Tahiti and the Marquesas are lush, evocative and intriguing, Gauguin’s artistic genius certain – but knowing a little about both men’s lives, I know who I’d most have wanted to go and visit. 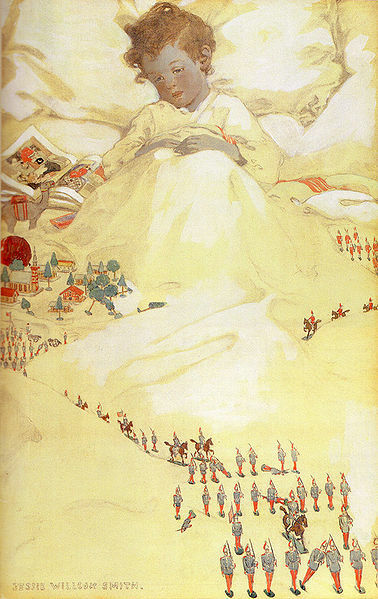 As Stevenson writes in Across the Plains: ‘To be honest, to be kind — to earn a little and to spend a little less, to make upon the whole a family happier for his presence, to renounce when that shall be necessary and not be embittered, to keep a few friends, but these without capitulation — above all, on the same grim condition, to keep friends with himself — here is a task for all that a man has of fortitude and delicacy.’ A man who valued ‘gentleness and cheerfulness’ especially, believed in adding to the good of the world, while still taking pleasure in life: ‘My idea of man’s chief end was to enrich the world with things of beauty, and have a fairly good time myself while doing so.’ Tusitala is certainly a top choice for my fantasy literary dinner party. Robert Lewis Balfour Stevenson once wrote: ‘This is the particular crown and triumph of the artist – not to be true merely, but to be lovable; not simply to convince, but to enchant.’ This lovableness, this power of enchantment surely was, and is, RLS’s enduring crown and triumph. Labels: ROBERT LOUIS STEVENSON. 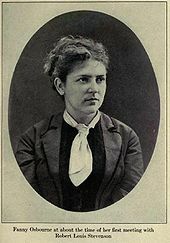 ISOBEL DIXON. 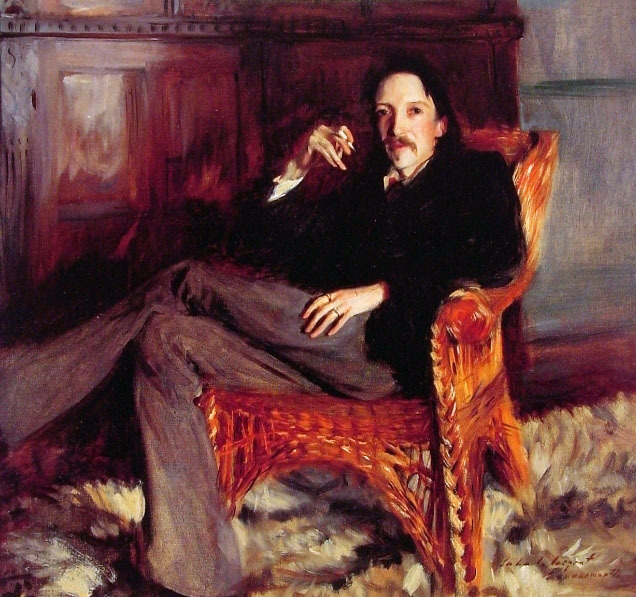 SARGENT. There used to be a second-hand bookshop on the Charing Cross road that had a set of his letters that I dreamt several times of buying but never did. I'm afraid the price was a bit too much beyond the reach of my humble purse. Oh thank you Rehan - that's a lovely comment. Interesting that you should mention the possible connection with Deacon Brodie. I also have wondered if Brodie was some sort of model for RLS, ideal citizen by day and criminal by night. This was a great post! I've bookmarked it because it is so rich in information about an author who has long intrigued me. I had A Child's Garden of Verses as a child, but never read his novels until I was grown up and writing MG novels myself. I loved Treasure Island. Have yet to read Kidnapped or The Black Arrow, but now they are on my TBR list for sure. Thank you Elizabeth... I'd love to re read all his work.